Last month on the blog, I shared all of the delicious foodie finds from my recent trip to New York City. I planned each day around visiting restaurants and cafes, but also made sure to mix up my itinerary with non-food attractions too so as to get as full of a New York City experience as I could. 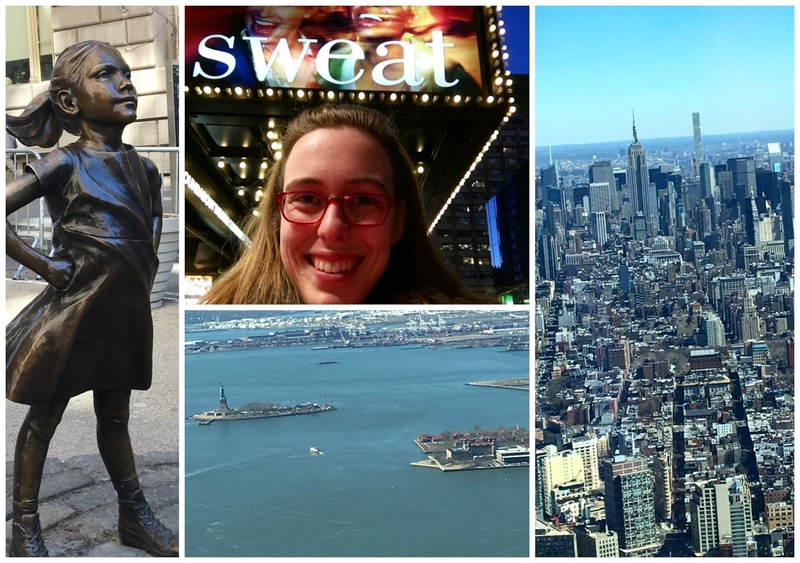 Unlike Washington D.C. (see my favorite D.C. attractions here)), I have only been to New York City a few times, which means that I am still discovering the city. I am by no means an expert. Nevertheless, I figured I would share my experiences both to share the highlights of my trip and relive the experience now that I am back to normal- bogged down by collegiate coursework. Although I love to travel, New York City is quite exhausting to visit, because the fast-paced city truly never stops. There's so much to do, and no matter how long you are planning on visiting, you will miss out on things and wish you had another day to explore. My first day in the city was a half day, as the train didn't arrive until noon. After walking a few blocks to my Chelsea hotel to drop off bags, my family set out for Times Square. I am not a huge Times Square fan-- it's just too crowded and sensory overload for my liking. However, it is almost an obligatory stop on any New York City itinerary. Walking a few blocks away from the chaos, We stopped by Saint Patrick's Cathedral, which is a beautiful and historic church that features breathtaking stained glass and cavernous ceilings. Accentuating the grandeur of the space, I was even able to take in a ethereal choir, which was nice to take a moment to stop and listen to. After leaving the church, I explored around 30 Rockefeller Center, indulging my love for the now off-air 30 Rock. From there, dinner was the next stop. 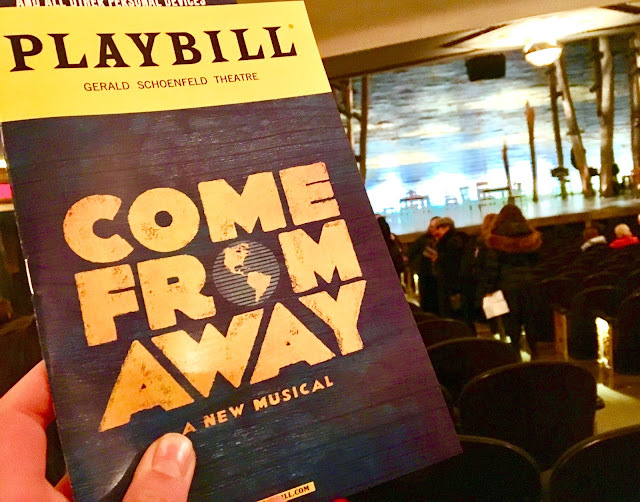 That evening I took in Come From Away, a new Broadway musical that I first experienced at Ford's Theatre in Washington D.C. Set in the town of Gander, Newfoundland on 9/11, the play follows the townspeople and travelers who spend days together when travel in and out of the United States was halted. The play is moving and has an uplifting message that will stick with you long after the cast takes their final bow. As an added bonus, I waited by the stage door after the performance and was able to meet the whole cast! They were all so gracious and kind and it definitely made my evening even more memorable. Food stops: Bareburger (lunch- Financial District), Senza Gluten (dinner- Greenwich Village), and DO, Cookie Dough Confections (dessert, Greenwich Village). Day two started early, and was packed with sightseeing. Heading down to the Financial District (Lower Manhattan), I started my day at One World Observatory, which is the visitor's center at the top of One World Trade Center- the tallest building in New York City. Promising breathtaking views, the building is extraordinary, and on a clear day you can see the city from a different angle. It's easy to point out sights such as the Brooklyn Bridge, Statue of Liberty (below, center), Empire State Building, and even surrounding states. While I am not big on heights, the experience is definitely the best "observatory" attraction in the city and it was nice to have an unlimited time to wander around the 360 degree viewing area. After taking in a bird's eye view of the city, I walked around the Financial District and made sure to stop by and see "Defiant Girl" the statue of a brave little girl who stares down the famous Wall Street bull statue. It was cool to see more people taking pictures of her than the bull! From there, it was lunch then a visit to the Museum of American Finance, which is a cool little museum that features artifacts that chronicle the role of the stock market, currency, and baking in our lives. After Dinner, I was able to get rush tickets (on the Today Tix app) to a preview of Sweat, a new play that delves into the lives of friends working in a factory town in Pennsylvania. Exhilarating, thought-provoking, and timely, the play was well-acted and transported me to the time and place of the on-stage action. Usually I prefer musicals to straight plays, but this one will stick with me for a long time. Food stops: Cafe Frida (lunch, Upper West Side), By the Way Bakery (snack, Upper West Side), and The Little Beet Table (dinner, Kip's Bay). After two busy days, day three had a less rigorous schedule, mainly wandering around Central Park and exploring the American Museum of Natural History. Growing tired of the ceaseless motion of the city, I loved the quietness and natural beauty of Central Park. As I walked though, I instantly recalled famous scenes from movies and TV shows that were filmed there. Spanning 35 million square feet, it's easy to lose yourself wandering through the park, and you have to plan your route strategically to make the most of the park's sightseeing. My favorites stops? 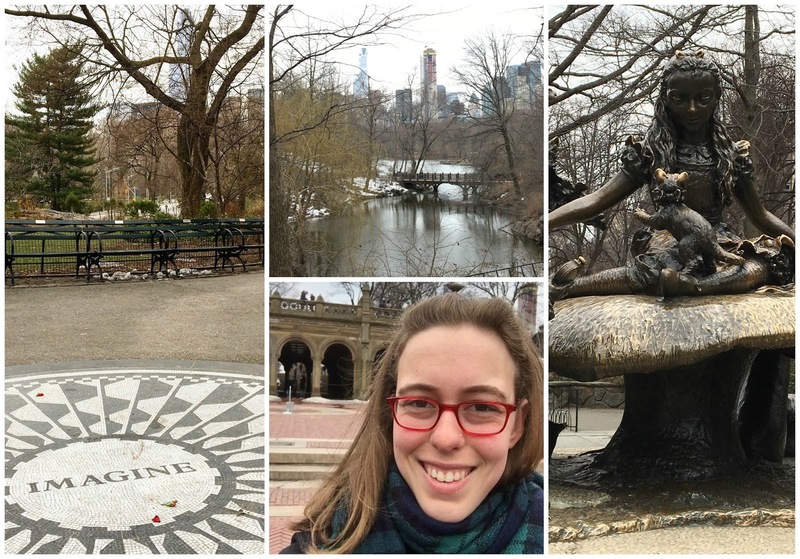 Strawberry Fields and the Alice in Wonderland statue. When a drizzle of rain threatened the afternoon, I ducked into the American Museum of Natural History (of Night in the Museum fame). Like Central Park, there's almost too much to explore here, as their exhibits spans every continent and even outer space. Crowds definitely made exploring challenging and took away from the experience a bit, but it was cool to be in such a storied museum. After a late lunch, I explored the Upper West Side, wandering in to independent bookshops and enjoyed the quieter, more residential neighborhood (in comparison to Times Square and the Financial District). Venturing back to the hotel late in the afternoon, it was time to pack and prepare to depart early the following day. I really enjoyed my New York City trip, precisely because it had a nice variety of food sight-seeing and playing tourist. I knew from visiting the City last year to build in down time and not plan every minute of the day to allow for spontaneity. Although there's ample public transit in New York City, I found that cabs and ride share (Uber/Lyft) were convenient and affordable ways to travel. Although I don't have a return visit in the near future I would love to hear your recommendations for New York City attractions to visit on a future visit. It's so hard to narrow down places to visit, and I could definitely use your help!